It's time we checked in again to gauge the overall health of the real estate market, both nationally and locally. 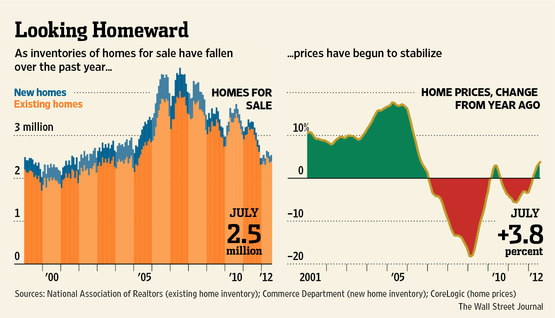 Here's a quick roundup on how the market is faring as we leave the fast-paced summer months behind. A recent article in the Wall Street Journal indicated that home prices posted their strongest gains in six years during the first half of 2012, a clear sign that many of the nation's real estate markets have hit bottom. While this statement looks promising, it came with a warning: hitting bottom shouldn't be confused with full-on recovery. The biggest news continues to be a lack of inventory in many markets, which is pressuring house prices to gradually rise. Inventories of existing homes are at an eight year low, while fewer distressed homes have hit the market and many sellers postpone listing in hopes of an uptick in price. Meanwhile here in Santa Barbara county, south county sales are up 43% year to date. This is an incredible gain, with sales coasting steadily throughout the summer at a record breaking pace. Over the course of the last five years, local market trends have seen a steep drop in sales over the summer months, while this year we experienced a steep gain in May and a solid summer plateau. On the lower end of the market, inventory is extremely low while many sellers try to ride out the market bottom. Here in Montecito, the high end continues to be very strong, and our office is a flurry of activity!